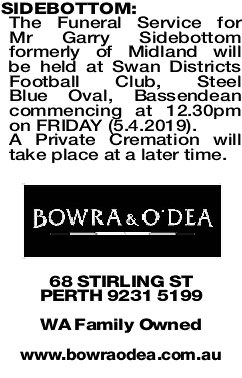 The Funeral Service for Mr Garry Sidebottom formerly of Midland will be held at Swan Districts Football Club, Steel Blue Oval, Bassendean commencing at 12.30pm on FRIDAY (5.4.2019). Passed away peacefully 28th March 2019. 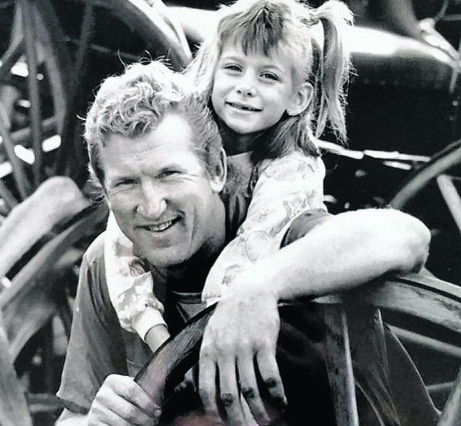 You were my biggest supporter, mentor and best friend. You shaped me into the man I am today and I am so thankful to have had a father like you. Ride on, Dad. We will always miss you. Love your son, Garry. 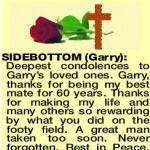 SIDEBOTTOM GARRY No words we write will ever say how much we miss you. 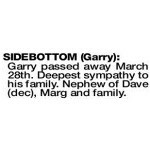 Garry passed away March 28th. Deepest sympathy to his family. Nephew of Dave (dec), Marg and family. 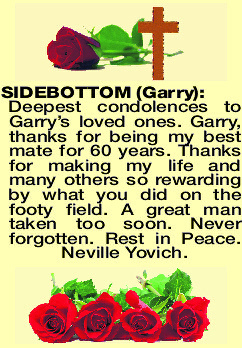 In loving memory of our champion nephew Garry who entertained us and many others on the footy field. Your brilliance will always be remembered and we are proud to have shared a lifetime of memories with you. 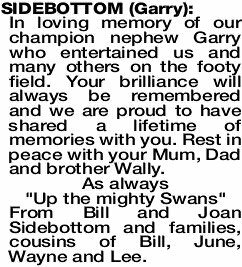 Rest in peace with your Mum, Dad and brother Wally. 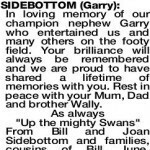 As always "Up the mighty Swans" From Bill and Joan Sidebottom and families, cousins of Bill, June, Wayne and Lee. 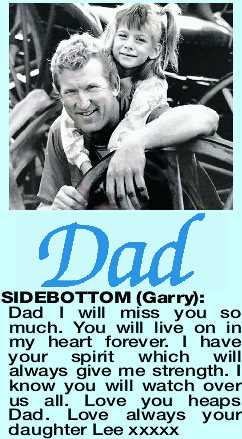 Uncle Garry has been such a great presence in our lives. We will never forget all of the great conversations we had with him and we are so thankful for all the memories we will have forever. We know he will live on in all of you, his wonderful children. With all our love to you all. 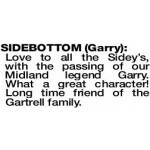 SIDEBOTTOM GARRY Love to all the Sidey's, with the passing of our Midland legend Garry. What a great character! Long time friend of the Gartrell family. 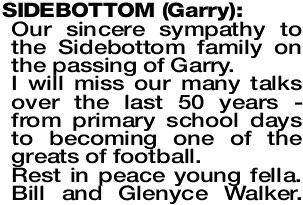 Our sincere sympathy to the Sidebottom family on the passing of Garry. I will miss our many talks over the last 50 years - from primary school days to becoming one of the greats of football. Rest in peace young fella. 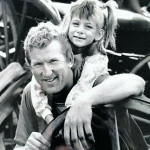 Bill and Glenyce Walker. 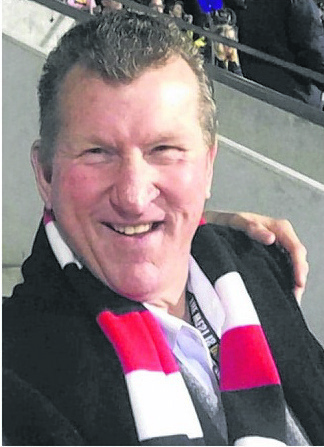 SIDEBOTTOM GARRY The West Australian Football Commission and our extended WA Football Family, extent our deepest condolences to all family members and the Swan Districts Football Club on the sad passing of Garry. 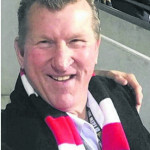 Garry was a champion player; a member of the Swan Districts Football Club's Team of the Century and a proud member of the WA Football Hall of Fame. Garry has left a significant footprint on WA Football and his legacy has been etched into our States proud history and tradition. 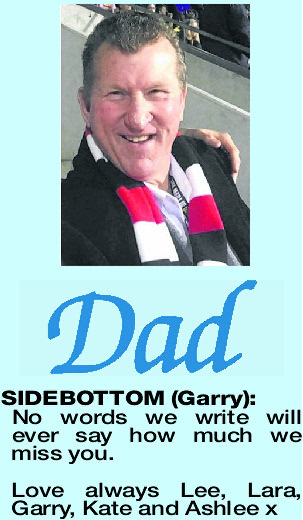 SIDEBOTTOM GARRY Deepest condolences to Garry's loved ones. 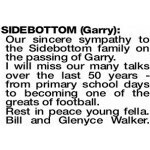 Garry, thanks for being my best mate for 60 years. Thanks for making my life and many others so rewarding by what you did on the footy field. A great man taken too soon. Never forgotten. Rest in Peace. Neville Yovich.